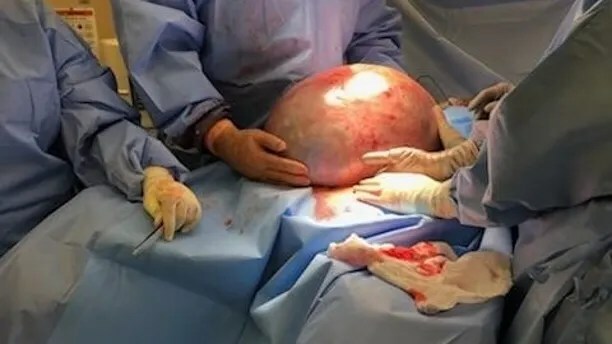 An Alabama woman was taken to the emergency room for surgery, after struggling with severe abdominal pain and unexplainable weight gain. Kayla Rahn, 30, explained how her pain was so severe, she couldn’t even walk to her car without loosing her breath or do any normal day-to-day activities such as getting groceries. When she went to the hospital the first time, medical professionals stated her solution was simple: lose weight. Rahn stated her pain had gotten overwhelming around May. That is when Rahn’s mother decided to take her to the emergency room at Jackson Hospital where after multiple test and CT scans, medical professionals informed Rahn she would need emergency surgery the follow day. Since the removal of the benign cystic tumor on May 26th, Kahn has lost 75 pounds and is feeling much healthier. Rahn stated she was relieved to have answers after successfully being operated on May 26th. She was later put in intensive care unit for a couple of days, so her organs could move back into place. Her incision ran from her chest to her pelvis. Rahn stated the best advice she could give anyone is to always listen to your body and advocate for yourself. How and why did she get the cyst? Well, ovarian cysts are actually very common and usually harmless. Many women never even know they have them, due to cysts coming and going without a problem. According to Mayo Clinic, they usually dissolve on their own. Yet, when they don’t they can cause pain and bloating if not treated, forcing the ovary to rupture or twist causing internal bleeding. What are the symptoms? Usually, one will experience pelvic pain that won’t stop, bloating, persistent stomach issues such as constantly feeling full, an urge to urinate all the time, and back or leg pain. Our advice? Remember to consult with your doctor, if you feel you might have one of these symptoms to avoid any possible threats.